I know absolutely nothing about Chinese history. Well, not absolutely nothing. I have a vague notion that there was a period during the first few centuries of the previous millennium where the country was carved up among a variety of warlords. For what feels like eons, these despots fought each other incessantly for wealth and power until further battles shifted focus towards the centralization of power within this huge nation rather than letting things exist in a carved-up rag-tag fashion. That's it. That's all I know. I grant you it ain't much and it's most certainly a far cry from the knowledge I've gleaned on the subject of American history - a knowledge I garnered mostly from American cinema. But I feel no shame on this front - especially not within the context of John Woo's new picture "Red Cliff" which might actually be the first movie to present a piece of Chinese history in a manner that makes some sense to me. Part of this, I believe, is rooted in Woo's consumate skill and artistry as a filmmaker. Woo's stylistic virtuosity not only presents the historical events of the picture with the kind of airtight adherence to narrative that made his best pre-Hollywood work like "The Killer" and "Hard Boiled" such fine movies, but he does so with a clear love of Hollywood cinema. He is clearly influenced and in the same league as such American Masters as John Ford and Sam Peckinpah - expertly blending the sentiment and manly honour with action and violence that borders on ballet (here we also see Woo's love of the American musical). "Red Cliff" holds the distinction of being the most expensive film ever made in China and it has broken boxoffice records all over Asia in a two-part 280-minute epic. Alas, on its first-run in North America, we are getting, not two parts, but one shorter version that clocks in about an hour shorter. Some of the action of the narrative feels rushed and truncated in this version, but luckily, what Woo does best, is gloriously intact. Set around 300 CE (instead of the proper Christian "A.D."), "Red Cliff" tells the story of an epic battle between an alliance of southern warlords against the much larger and more powerful northern force. It's a classic right versus might tale and I'm grateful that Woo directs with such style, verve and storytelling savvy that I feel substantially enriched in at least one small part of Chinese history. Most of all, it's one hell of a good show. Woo paints a gorgeous series of pictures with the kind of epic sweep that only a master can bring to the table. Replete with gorgeous compositions, plenty of intrigue and romance, healthy dollops of male honour and camaraderie and truly ferocious and thrilling battle scenes, "Red Cliff", even in truncated form, does not disappoint. Woo's mastery of cinema allows for the kind of action set-pieces that feel unlike anything we have seen in recent years. Even though he maintains, like Peckinpah, a cutty style of movement, his sense of geography is so first-rate that we always know where we are in any given field of battle. Like Peckinpah, as opposed to virtually every other hack working in movies today, Woo infuses his action with emotional weight. Every edit is a story edit - moving the narrative ever-forward. And every act of violence is a skilfully choreographed ballet that not only looks great, but carries considerable dramatic impact. His sense of composition, like Ford, is painterly. I cannot think of a single frame that isn't wrought with the care and love of a true artist. And even though things move a tad slowly in the first hour, the final ninety minutes leave you wanting more. In fact, I had such a good time that I immediately wanted to watch it again. This is a rare occurence in contemporary cinema. 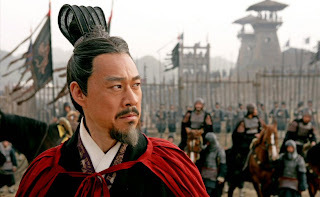 "Red Cliff" is a big screen must-see event, but even still, I would prefer additional helpings of this picture to come replete with the whole damn thing. As such, I am hoping and praying that my next encounter is the full 280-minute version. I suspect that when this happens, it'll be very easy to knock my rating up to a full four stars. Some have referred to this as a comback film for Woo. I don't think Woo really went anywhere. He patiently delivered expertly crafted Hollywood genre pictures. Some were good and others not so good. And now, he's simply and happily back where he belongs - with a story that inspires him and talent in front and behind the camera that delivers 110% to make sure his vision is everything it has, can and will be.